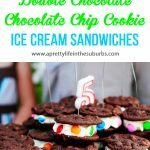 These Double Chocolate Chocolate Chip Cookie Ice Cream Sandwiches are such a fun summer treat! 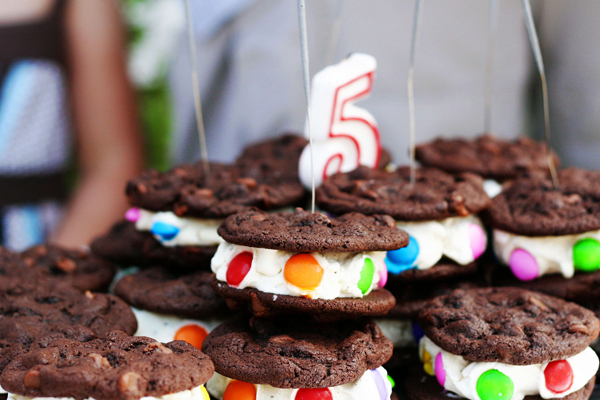 Make a batch of homemade cookies and fill them with ice cream, then let the kids decorate! Chocolate-Chocolate Chip Cookie Ice Cream Sandwiches. Now that’s a mouthful of yum-yumminess! 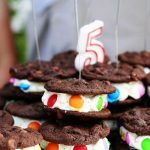 A few years ago when my daughter turned 5, I made these ice cream sandwiches instead of cake. And they were a hit! 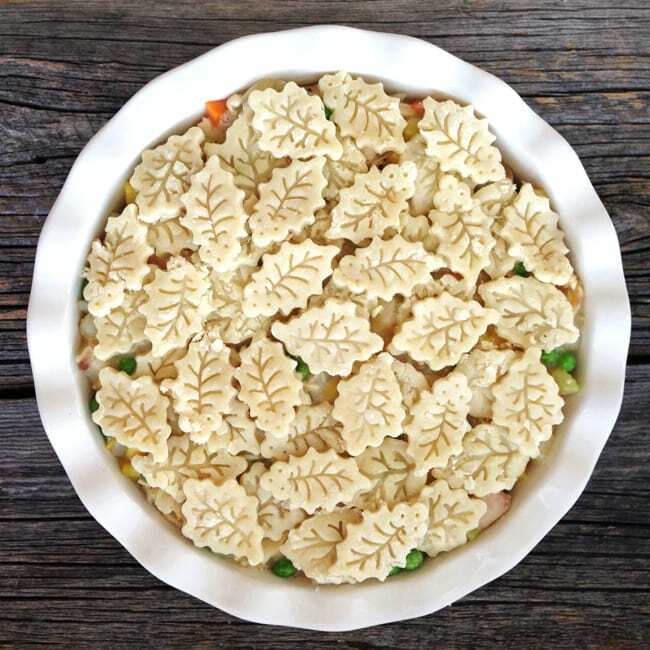 Not only are they pretty, but they are so, so delicious! Chocolate-Chocolate Chip Ice Cream Sandwiches! 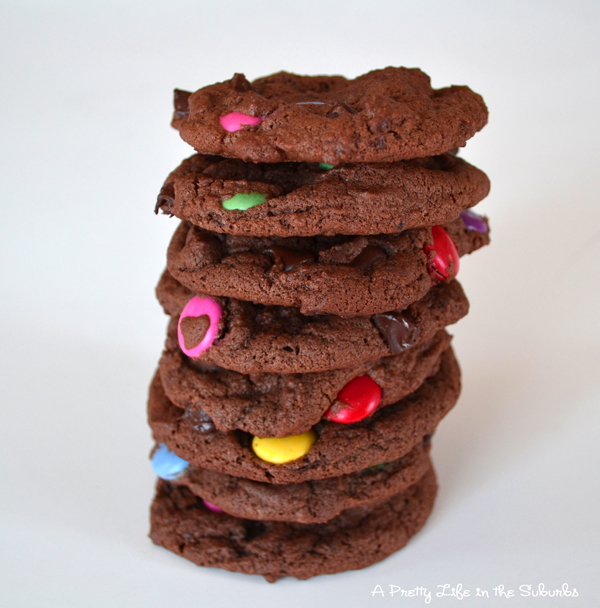 I don’t love crunchy candy in my cookies, but the kids love the Smarties in them! Not only do they make great ice cream sandwiches, but they are also great just as a cookie! This is what I am sending with Mini-Suburb #2, to the bake sale tomorrow…you may remember from a previous post on my bake sale botch. I had to step it up a notch this time around! Hopefully these do the trick! 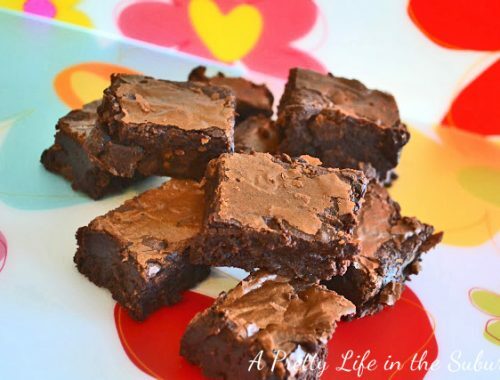 These would make a great dessert for a July 1st or July 4th backyard party! For a party, you could even let your guests decorate the ice cream sandwiches themselves! In a separate bowl, sift together flour, cocoa powder, salt and baking soda. Add flour mix to sugar mix, and combine. For regular cookies, drop 1 heaping tbsp of batter onto cookie sheet and bake for about 10-12 minutes. For larger cookies for ice-cream sandwiches, drop a heaping 2 tbsp mound of batter onto the cookie sheet and bake for 15-18 minutes. Watch carefully. They are best when still a bit soft and chewy. You can assemble your ice cream sandwiches about 2-3 days ahead of time. Scoop about 1/3 cup ice cream between 2 cookies. And what a wonderful day it was . . . These are so pretty and they look really yummy too! These look amazing and are the perfect summer treat! I’ve never made ice cream sandwiches before but if I do, I am definitely using this recipe! I like the idea of the double chocolate cookies with some rich vanilla ice cream. And the smarties are a great touch – they look much more fun and kid-friendly for the bake sale!! These look delightful! I just pinned this on my Pinterest! so INSPIRED by colored mnm’s now. lol, I love this idea, so simple and it looks delicious! These are so fun! Absolutely adorable! They look so pretty! And the recipe sounds so yummy too! These look DELICIOUS! All of my favorite sweets combined into one! YUM! I saw you on Get Your Craft On! These look awesome. 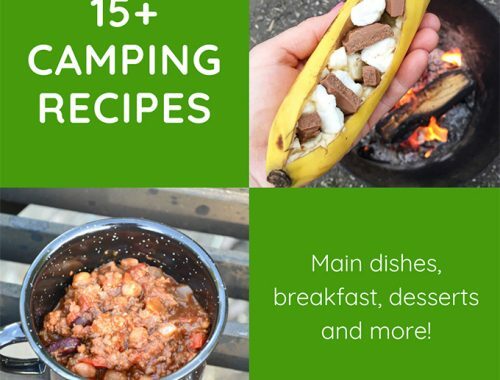 yeah…so glad to see this recipe. I found one awhile back and was going to do them for my son’s birthday this week and lost it. I was sure they were fairly simple, but I wanted a good cookie recipe to go along with it! following you via tip junkie!! My son’s birthday is July 1st and these are just perfect! Mmmmm it looks so yummy! Might have to try this one for the next backyard barbecue! Chocolate chip chookies and ice cream are my two favorite sweets! I don’t know why I have never thought about putting them together! Great idea! I’d love it if you stopped by Workshop Wednesday and shared it for the party! Yummy! I’d love for you to come share this at Fun For Kids Friday! I would love to have you share this on our weekly playdate party! Come & Join the Playdate! These ice cream cookies look delicious. They would be so fun for a birthday party. Awesome, awesome, awesome! This post has been featured in this week’s For the Kids Link Party! Stop on by and grab an A++ button for your blog! And LOVE to have you link up while you’re there 🙂 We’re starting another week of kid-friendly fun! These cookies look so tasty!! Thanks for sharing. Gorgeous! I dont know any kid or adult alike that wouldnt be completely elated with one of these little cookies 🙂 bet they taste scrummy too, so pretty! Ice cream biscuits looks fantastic! My family doesn’t eat cake, so this would be an excellent alternative. Can’t wait to make them. Thanks for posting. WOW!! What a great idea. My son would love these for his Birthday. The Smarties are a must. You are so welcome! Enjoy – kids love them! !